For an in-depth breakdown of motorcycle brakes at the highest level, look no further than the Brembo MotoGP Brake Facts for the Argentinian GP. The MotoGP 2018 season round two will take place this weekend at The Termas de Río Hondo Circuit in Argentina, April 6-8. 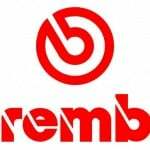 Brembo brakes will be on every bike in the top class of MotoGP this season. 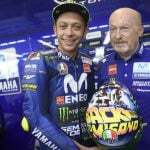 After the season got off to a difficult start, MotoGP is flying to South America for the Argentina GP that is being held from April 7 to 9 at the Autódromo de Termas de Rio Hondo. Located in the province of Santiago del Estero in the north of Argentina, the circuit was designed by Italian Jarno Zaffelli. The brakes chosen by all of the teams and riders in the premium class are also Italian, Brembo naturally. Every year, the Autódromo de Termas de Rio Hondo hosts dozens of car competitions so when the MotoGP bikes land in Argentina, they are faced with a very dirty track. In the first free practice session of 2016, there was a great deal of sand on the asphalt and the lap times were recorded at 1’43’’-1’44’’. These times were reduced by more than three seconds less than 24 hours later and by another second in the Q2. 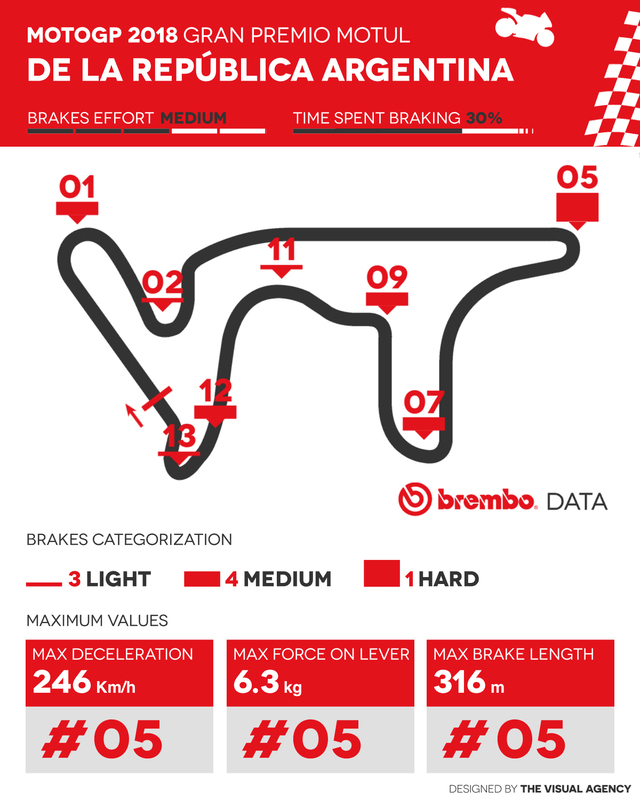 According to Brembo technicians, the Autódromo de Termas de Rio Hondo falls into the category of circuits that present a mid-level of difficulty on the brakes. 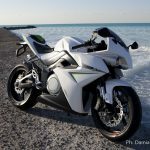 On a scale of 1 to 5, it earned a 3 on the difficulty index, the same score given to eight other tracks including Losail, which hosted the season’s inaugural race. The 14 curves on the track correspond to eight braking points, three of which are on the T4. Despite these delays, the T4 remains the fastest of the four split times that the track is divided into. Only Phillip Island, with six braking sections per lap, and Spielberg and Sachsenring with seven each have fewer braking sections than Termas de Rio Hondo. Each lap, the riders use their brakes for about 30 seconds, the same amount of time spent braking in Barcelona and Misano. 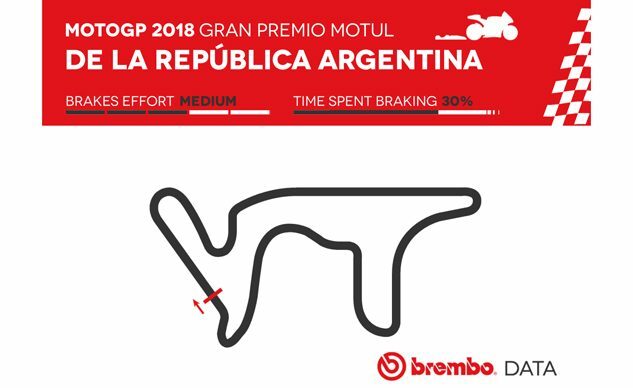 The total time spent braking during the entire Argentina GP is 12.5 minutes, which is 30% of the overall duration of the race. The average peak deceleration per lap is 1.11G and this statistic would be higher if it weren’t for the quick braking needed on curve 11 (from 194 km/h to 160 km/h), that with 0.6G lowers the average. Summing up all of the force applied by a rider on the Brembo brake lever from the starting line to the checkered flag, the result skims 900 Kg. Only at Phillip Island is there less physical effort required of the drivers. MotoGP bikes are equipped with Brembo 320mm (12.6″) or 340mm (13.3″) carbon discs while Superbikes use steel discs, so even if the physical demand is low for MotoGP, the Argentina GP demands more force from the MotoGP riders than Superbike riders: about 600 kg in Round 1 in Australia, 770 kg in Round 2 in Thailand and 820 kg in Round 3 in Aragon. 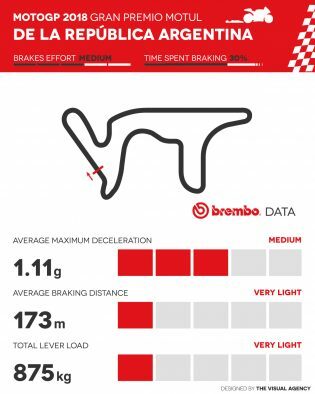 Of the eight braking sections at the Autódromo de Termas de Rio Hondo, only one is considered very demanding on the brakes while four are of medium difficulty and three are light. Curve 5 is the most challenging because it is preceded by a 1.076-meters straightaway where the MotoGP bikes get up to 324 km/h. This small hairpin turn forces the riders to go down to 78 km/h, laying on the brakes for 6.1 seconds and applying a load of about 6.3 kg . on the lever for the Brembo master cylinder. In that precise moment, the pressure of the Brembo HTC 64T brake fluid reaches 10.9 bar, which is 2.5 times the pressure of a can of Coca Cola. While braking, the bikes travel just over 316 metri, which is five times the distance traveled by Diego Maradona while dribbling in the 1986 World Championship to score the goal of the century. Among the curves that present medium difficulty, it is worth mentioning the first one after the start line because of its 262 yards of braking space: the MotoGP bikes go from 271 km/h to 106 km/h, but the deceleration is just 1.2G compared to the 1.5G at turn 5. On the other hand, 1.2G is much higher than the 0.9G many street supercars experience in braking.